In high-cycle applications, spring-applied brakes are subject to two kinds of stress. 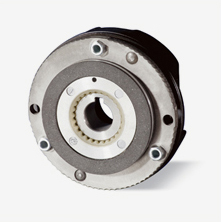 Due to the large number of load alternations, the service life of the brake is determined both by the mechanical components of the brake itself and the useful life of the rotor, which is based on friction energy. In particular, the rotor/hub connection, the springs and the sleeve bolts are subject to wear due to the number of load cycles. Based on the components mentioned, without additional measures the service life of spring-applied brakes is limited to 1x106 to 4x106 load cycles depending on the load.